I wanted to thank you all for the kinds comments on my fall home tour last week! It was fun to share the simple fall touches I added inside our home. 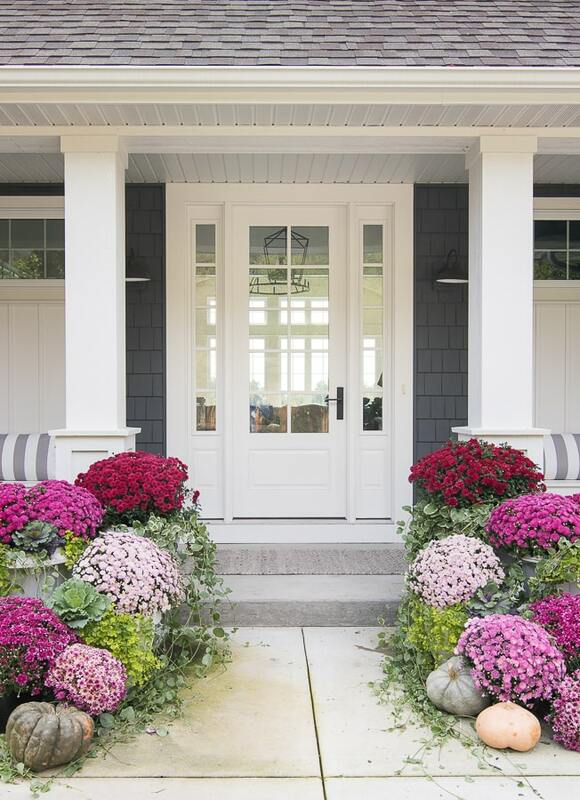 I held out one space on you though, and that is our burgundy and pink fall front porch decor! I’m finally sharing it today, and I’m so excited to be joining in on the Seasons of Home tour Series hosted by Kristen from Ella Claire. 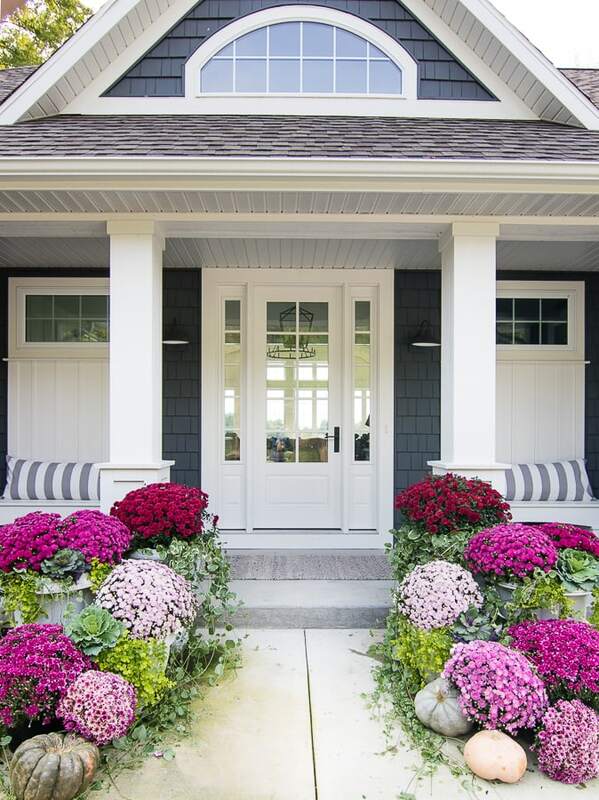 Be sure to check out all the amazing front porches my blogger friends are sharing – so many inspiring ideas! While I added bits of rust and orange inside our house, I stuck to the burgundy and pink color scheme I used last year on our porch, subscribing to the old “if it ain’t broke don’t fix it” adage. I will say this is Burgundy and Pink Fall Porch 2.0 because I went a little nuts at the local nursery. I mixed in several shade of light pink to deeper purple, but also added in some kale and cabbage too. Some creeping jenny got added to my planters as well to echo the greenery in my flower boxes. Instead of keeping my hydrangeas in my larger planters like last year, I decided to transplant them into the ground beside our sidewalk and I’m crossing my fingers that the earlier transplant helps them to bloom better next summer. I kept all the ivy I had growing in the planters, because it went a little crazy. I tease my kids not to let their ankles get too close or it will grab them. This stuff seriously is taking over our steps. I added in the burgundy mums where the hydrangea used to be. It’s hard to tell, but I have 3 large planters of different heights on either side of the front walk with a few smaller buckets in front. I love that from far away it looks like a big cascade of color. I recovered my bench pillows (which are just inexpensive body pillows read more about that here) in a taupe striped fabric to offset all the bright colors and added a neutral cozy runner from Target. 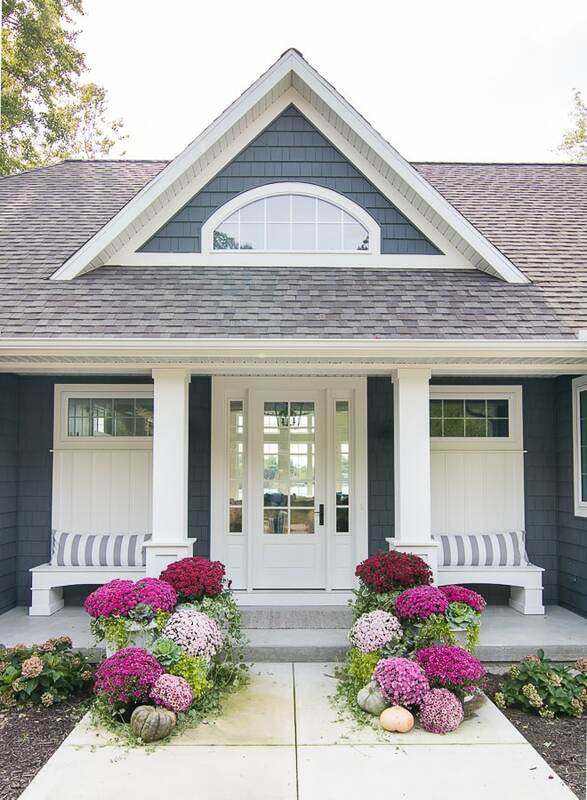 Be sure to stop by all the other front porch designs below! Also, if you are new here thanks for stopping by our lake house in Michigan – you can take our full home tour here. Very, very pretty and inviting. 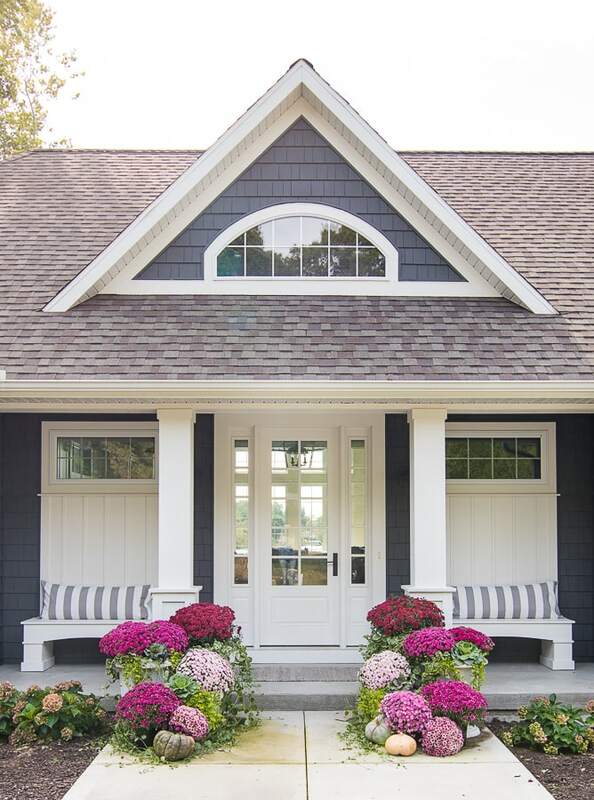 The cool pinks beside the warm deep reds are SO pretty in front of your dark siding, The cabbage ‘roses’ are a sweet touch and I LOVE the new wide stripe pillow covers. I’ve given up, sadly, on fall flowers because the deer and a pesky local groundhog think it’s their personal dinner buffet. The first time I woke up and found nothing but stems sticking up out of my pots I didn’t know whether to laugh or cry! (My hubby says my shocked reaction WAS pretty funny though.) So, for a bit of fall whimsy, I posed my big jointed skeleton and a ‘normal’ faux pumpkin on a chair in my den. We both chuckle every time we see him. Oh no ha!! It’s so odd we don’t have issues with deer here because we see them all the time! I’ve probably just jinxed myself lol. My kids would love your skeleton! Happy Fall Dori! I love this take on the traditional Fall decor colors. Beautifully done! Love the colors! Looks great! Thank you, it’s fun to decorate this space! Thank you and your friends for sharing all those great fall decorating ideas. I totally enjoyed each one. Hi Kelly! I love the purple, blue and green together. It looks beautiful agains the blue of your home! Thanks for sharing and happy fall! Thanks Lauren Happy fall to you too! Love your house! 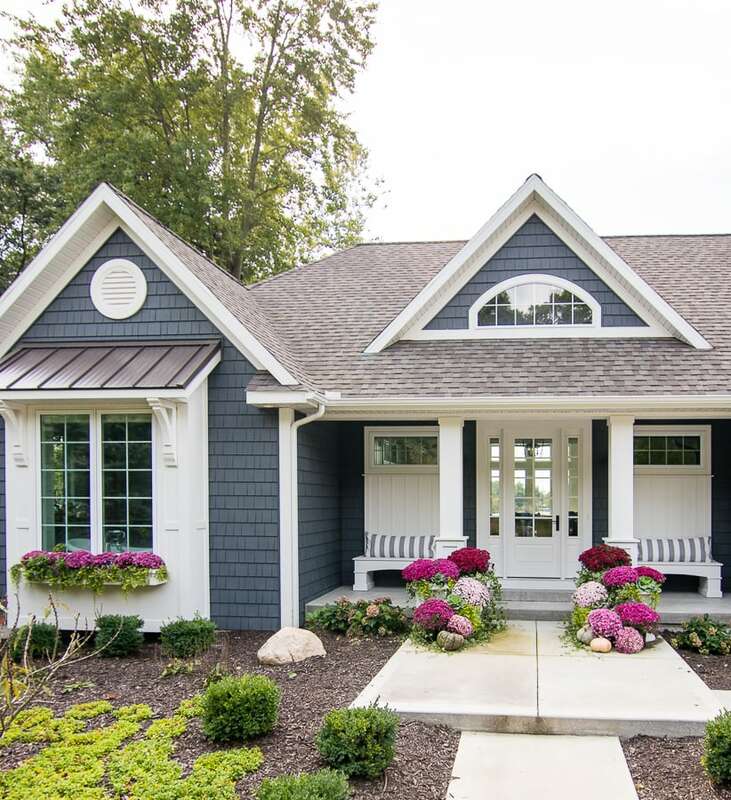 What is the exterior paint color? Thanks! 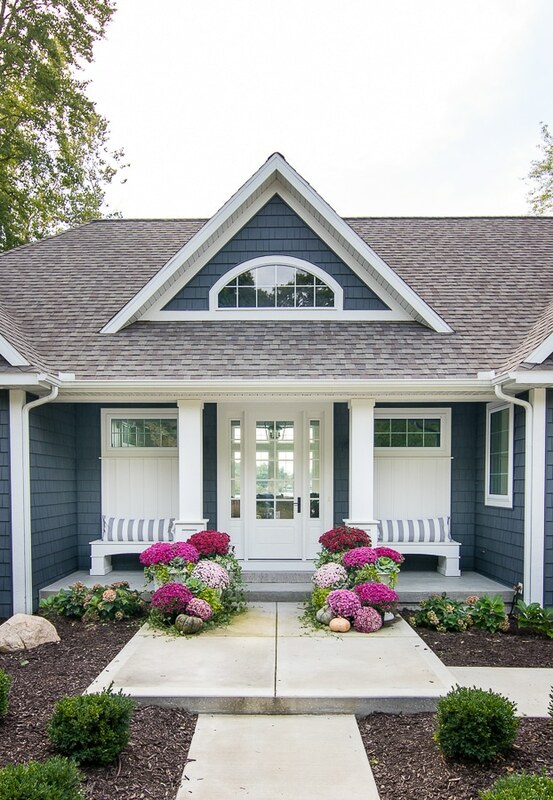 It’s siding by Mastic, the color is Natural Slate – thanks!